Laurie Wisbrun | Scarlet Fig: Wonky Donkey 2 Quilt...And a giveaway! So I was tickled when Kate let me know that she was going to be re-doing her pattern using my new Jack and Jenny line. She's just revealed the new quilt on her blog along with the news that the quilt will be making its debut at Australian Quilt Market in the HQW Distributors booth in a few weeks. Congrats Kate!! 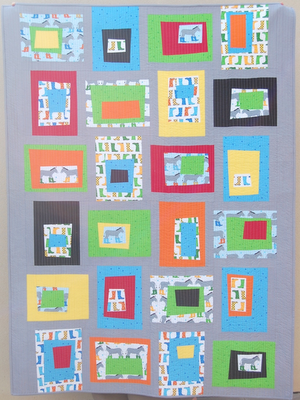 Pick up a copy of the Wonky Donkey 2 quilt pattern here from Kate's store. Its a fantastic pattern and it looks like it would be really fun to sew. And although Kate's no longer living near Fizzy, she was able to track down Cocoa, who was her obliging quilt model for the new Wonky Donkey 2! How wonderful is this shot? And Cocoa looks really soft doesn't he?! To kick off the weekend (TGIF!) I'm giving away a FQ set of the entire Jack and Jenny line. All you need to do to be registered is leave a comment here on this post. I'll draw a winner this Sunday evening, 5/20. And if you have any ideas to share when you leave me your comment, Kate's wondering if she should keep the quilt pattern named Wonky Donkey 2 or change it to something else. Hop over to her post and read through her Wonky Donkey story. It will definitely make you giggle and maybe it will inspire you with some naming ideas. Aaaaaahhhh! That fabric combo with the quilt is too cute! Love Cocoa! That is such a great fabric line! I think Wonky Donkey 2 suits it. :) I think the donkeys love it! How about Dinky Donkey? Having a large soft spot for both donkeys and rain boots, I would love to win this collection. I like the current name for the quilt but if Kate wanted to be silly, she could call it "Wonky Donkey 2: Rainboot Boogaloo." I love all your animal fabric lines! The llamas, birds and the donkeys, oh my! Kate's post was definitely entertaining. The first line cracked me up "There's nothing cuter than a donkey in boots". Prior to the fabric lines, who ever thought of a donkey in boots?!? The fabrics are adorable though and I would LOVE to win! I like the Wonky Donkey name -- descriptive and it's fun that it rhymes. Wonkey Donkey is a great name and totally makes me giggle. Love the galoshes! I guess a mule is not quite a donkey, but "Cool Mule" sprung to mind. Great fabric and a wonderful quilt pattern. Thanks for the chance to win! I love this fabric! And, the llamas! Gives me a smile each time I see them :D! Absolutely love these fabrics; Wonky Donkey fits perfectly, why change? Hummmm. How about the Wonky Donky Dance from the Wonky Donky Line? Such splendid boots on a happy donkey bring jig and jive to mind. Ah! Wonky Donky Jig and Jive! My daughter would have so much fun with this pattern! Love the cute pics of the models! Hard to top Wonky Donkey. What a fun photo shoot. Love the fabric line. Lovely. Wonky Donkey sounds fun. Thanks for the chance. Even if I don't win, it was worth the time to get to see Fizzy. So cute and it made me smile!! Great fabric as well, but I'm in love with Fizzy. I LOVE this line -- and am eagerly waiting for the polar bears to come out! Oooh I love donkeys, seriously like best animal ever! ooh that donkey is so cute and the line is super fun. I love the boots! OMG, I think I'm in love. I love the Jack and Jenny line! When I was little I wore plain red rainboots and I wish I'd had a pair of these happy boots. I would have made jumping in puddles an extra special joy! I totally cracked up at Fizzy's photo shoot and now it's followed up by Cocoa. Hilarious!!! Love your donkey's and Kate's pattern is perfect. Thanks for always sharing your fabric! Not only do I really love this fabric line, but I think I could snuggle Cocoa all day long. That is one soft-looking donkey! Wonky Donkey is a great name for a quilt pattern, but it also sounds like it would be an awesome name for a folksy rock band. And Cocoa looks so sweet! Not sure what you mean by "registered" but I do follow your blog on Google Reader! Oh, thanks for the chance to win. I LOVE these donkeys sooo much. I would stay with the wonky donkey name! I think this is the most adorable fabric and Wonky Donkey is a great name! Love this fabric range, please enter me even though it's Friday afternoon here and I'm exhausted and lacking in inspiration!! I vote for Wonky Donkey Part Deux. Love the quilt model choices. I love the name Wonky Donkey, it's a phrase we use often here. My husbands family looked after donkeys when he was a child and he tells a story of his dad chasing a donkey but it was his dad wearing wellies not the donkey! Wonkey Donkey 2 will do fine. Love her finding the new donkey and love the new quilt. But then I love Kate's pattern's and your fabrics so can't go wrong there ! Fizzy & Cocoa... what great models for your fabrics!! That is a great quilt made from some seriously cute fabric! Thank you to both of you for sharing this with all of us! Love it! I love the gray with all of the colors, so beautiful. I think Wonky Donkey 2 is a great name! I would love to win this line! It is so cute! LOL ... yes that is a fantastic story. I had forgotten Fizzy had tried to eat the first quilt, that part had me laughing all over again. I think Wonky Donkey 2 .. or too ... is a great name. Thanks for the great giveaway and sharing the great story! That quilt is so great! Cocoa is a great model! My son is working on an organic farm where they are using mules and donkeys to do some of the farm work. I think he'd love a quilt with this fabric. How about Donkey Dance for a new quilt pattern name? My 7 year old Gracie just cracks up whenever she sees that donkey fabric with the rain boots! She would love it if I made her something with it! I'd vote for leaving the same name...stick with what works! And it's fun to say too! Wonky Donkey! Someone already said it up there, but I like The Wonky Donkey Part Deux....or Strikes Back. I think this may be my all time favorite fabric. I've been collecting fabric for a "rain" quilt. I grew up in the Northwest and now live in the high mountain desert. Rain, boots and donkeys too. Thanks! those donkeys always remind me of my cousin who has a donkey! so silly. I'm a fan of the name Wonky Donkey. Maybe you could call this line Wonky Donkey Jr. I like the name - maybe create a line of Wonky Donkey's like Mama, Papa, etc. That's a very generous giveaway - it would be much loved at my house! Thanks for sharing. 'WONKY DONKEY' SURE HAS A RING TO IT-I LIKE IT! THANKS FOR SHARING A SWEET AND GENEROUS GIVEAWAY! I think Wonky Donkey 2 is just great!!! Love Cocoa too. i think its a fine name! Wonky Donkey Deux would be a cool variation. Regardless, you must keep Wonky Donkey as the main theme as fits perfectly! Cocoa does look nice and soft. We once had donkies and they were mean yet didn't keep the coyotes away from the calves as intended. I say keep it as Wonky Donkey 2 :) the name is so cool. Thanks for the chance in the giveaway! wonky donkey: the sequel? it's a cute name, i wouldn't change it too much. the fabric is awesome, kate's quilt is awesome, and the the donkey that tried to eat her first quilt is awesome. that's a whole lotta awesome! Just too adorable!! Both the quilt donkeys and the live donkey! I love the name and the fabric! Wondy donkey is so catchy! i love that line! the wellies are so adorable. Oooooooh! I haven't yet been able to track down each print, I'd LOVE this! I adore all of these, and each project I've seen made with them - this one is definitely no exception! hmm...wonkey donkey is a fabulous name. So that's hard to beat. How about donkeys and wellies? This is just the cutest line Laurie! And I love that Kate found a donkey to model her quilt...so fun. So sweet, and 'The Wonk goes on..."
I love these fabric. If I won, I will make some baby stuff for my nephew who just was born 2 weeks ago. I really like the wonky donkey II name! the quilt is great! thanks for the generous giveaway! lovely!! thanks for the chance! Love the quilt, so cute and colourful! Thanks for the giveaway too! This is such a fun fabric line! I'd love to win! I would love to make something out of this cute fabric line. Cool Name.. Love the fabric so unique..
Wonky Donkey 2 is a fun name but you could also call it Donkey Boots or Donkey Goulashes. I love Kate's quilt designs, and that quilt is so perfect for Jack and Jenny! Love the Wonky Donkey 2...how neat! Great givewaway! Thanks for the chance to win. I love these fabrics & Kate's quilts are really lovely too. The donkey models are gorgeous & I love the name Wonky Donkey - I think it's perfect as is. Thanks for the giveaway. Love the fabrics! Pick me!! Love your blog too. Gorgeous fabrics, love the quilt and the name brings to mind a children's book that my boys loved called "The Wonky Donkey". The fabric makes me remember my late step-father: he used to draw donkeys (horses? he was a lousy artist) with boots on. His donkeys were also smoking a pipe. I must make a wall hanging with your fabric for my little sister (55 yrs!) as we are now the only ones left of our family. 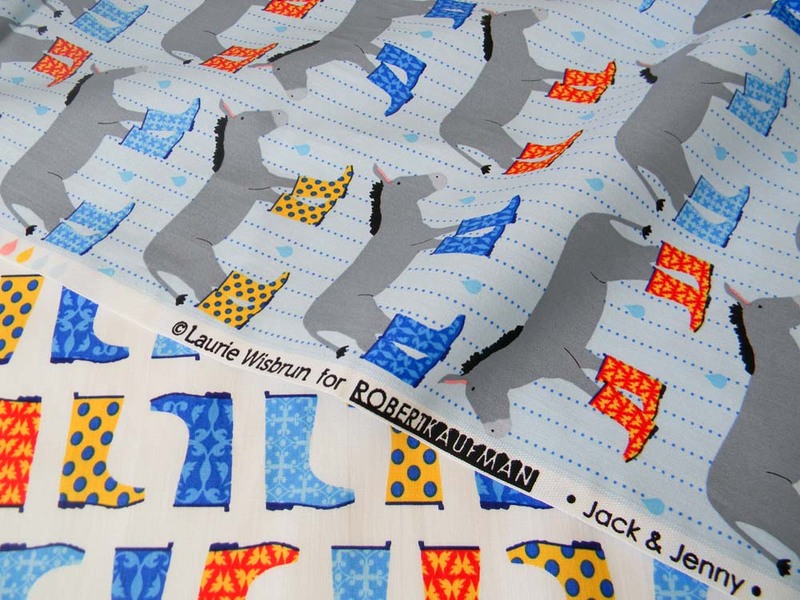 I love the Jack and Jenny fabric! 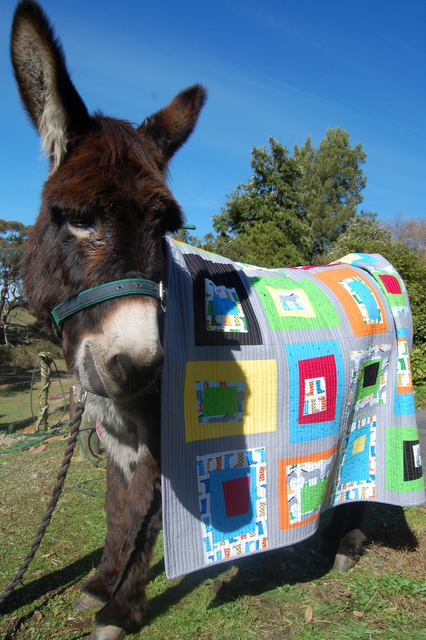 And the quilt looks good on the donkey :) I have never made a quilt before (always found it old fashioned :)) but the wonkey donkey is great! Thanks for sharing this, I'm planning on making one for my 9-month old son now. Isn't Kate darling? You, Kate, donkeys, wellies--so many of my favorite things are coming together! I can't top Wonky Donkey, but some of the suggestions by earlier commenters are pretty darned cute. Kate comes from where I live. After year or two of blogging this is the first time I have ended up where \i come from. Thanks for the wonderful giveaway, Laurie! I love those wonkey donkeys in Wellington Boots . So cute ! love the fabric - love the quilt. What about Cocoa Loco? I love Wonkey Donkey!! That fabric combo with the quilt is too cute! Jack and Jenny is such a fun fabric line! I think we should ALL "Do the Wonky Donkey"! HeeHaw!!! I love donkeys - we used to take care of our neighbors horses when she was sick and she had a donkey named AnnaBelle and she was so much fun and she would talk to you and she always had to roll in the barn alley before she went out after morning and night chores. She is gone now:( but this brings back memories of sweet, sweet AnnaBelle!!! Thank you for the chance and the memories!! I'm so glad this fabric got picked up! I can't decide if the donkeys are my favorite or if the llamas are pushing them out of the top spot. Regardless, keep up the fantastic designing! What fun fabric and love the name! Thanks for the chance. Wonky Donkey is the perfect name for her quilt! Love the pattern name as is, tis perfect! Love the fabric, so fun! Thank you for the chance to win. I love this fabric line! I adore the boots!!! I like Wonky Donkey! I think it is funny and fun to say! LOL That material is WAY cute!! There is nothing cuter than a donkey in Wellies! I don't know how she could top the name Wonky Donkey. Thanks for the chance to win! I ove the quilts and the models are just too cute. My lqs owner has eight donkeys. I will have to ask her if she has made this quilt. What a cute quilt. I've already made pjs for my son out of the jack & jenny line. I love this fabric, plus it helps that my children wear wellies in the backyard when they run out to play. This would be so fun to make this quilt with your fabric. 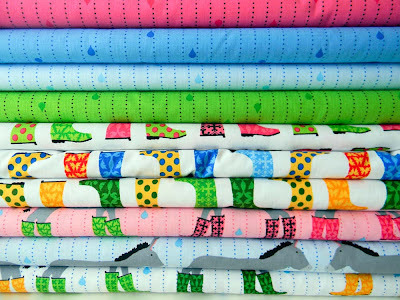 this is adorable, a great baby quilt is coming to mind for this fabric. How fun! Gotta love those donkeys! I think Wonky Donkey is just too cute not to use! I love these adorable little donkeys and can't wait to make cute baby things out of these prints. Thanks so much for the giveaway! Love this fabric and pattern!! Absolutely love this quilt and the fabric line! So cute! I try to use the word Wonky as often as possible. It's just FUN! Wonky donkey is very hard to top, I really like it! Love it! .....donkeying around maybe ....keep it up Laurie! Great quilt, great fabric and very cute model! I like the name Donkeys Gone Wonky for the quilt. Wonky Donkey is too great of a name to change!! I love the pictures. I worked at the GS Ranch in New Mexico as Burro Wrangler for several years... they are near & dear to my heart! I love the donkey theme and the posing Cocoa....He is the perfect model for your line....them boots were made for walking....and cute to boot!!!! oh my gosh, how I love this fabric. And since I am finally running out of DS's favorite (the "Urban Circus" elephants), it is good to know that there is something equally marvelous with which I can make things for him. I love your designs and Jack and Jenny are so cute! LOVE LOVE LOVE the fabric and the wonkey donkey quilt!! So cute! I love all your work and this quilt pattern highlights your line perfectly. just love the fabric and these shots of it are gorgeous! Really love the fabric and the donkeys too! Part deux sounds like a great alteration to the name as well! I love your designs. They make me laugh and they are so fun to sew with!! little mule. Thanks for the chance to win!!!! great fabric, great quilt, great name! what's not to love?!? The name Wonky Donkey makes me laugh, it's suitable and memorable! :) I love donkeys, I think they are pretty awesome - made better even with boots! Every time I see the gumbooted donkey it makes me grin! I like the Wonkey Donkey II name. It's the boots! Just love the way you have used them. Fresh! Many thanks for the opportunity and to see the cute fabric. Very fun for my democrat friends. How about Wonky Donkey Deux? I LOVE LOVE LOVE this line! 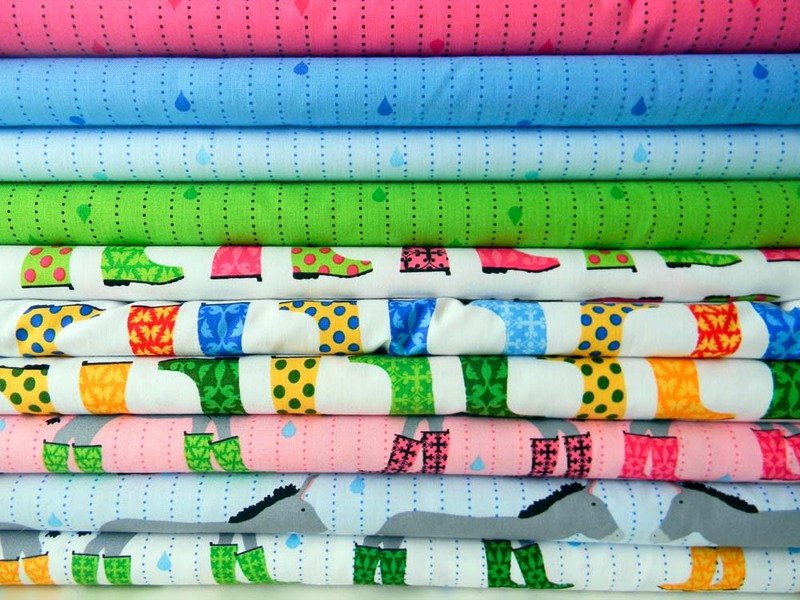 i like the name wonky donkey 2 - and the quilt and fabrics are fab! The facial expressions on the models are priceless!! Wonkey Donkey The Sequel was the first thing that popped into my mind. I guess if you called it "Wellie Wonky Donkey" it would sound like it's a donkey made out of chocolate. :) Love the fabric line!! I'd love to have some of this fabric. Thanks for the giveaway. This is such wonderful fabric, and Kate has of course come up with a beautiful quilt! I do love her stack and slash method!! I'd probably call it Wonky Donkey Redux, just because it sounds funny coming off my tongue.... Thanks for the chance to win!! Love your fabrics and bought your book. Love those quilts, she did such a great job using the fabric. I love your fabrics so much, I enter every single one of your giveaways, but never do win. I end up having to go buy some. My wallet may not like you as much as I do :P I love the Jack and Jenny collection and it looks great in that quilt! I think Wonky Donkey 2 is a great name for the pattern and I love that she found a donkey to photograph the quilt with! Another Kate Conklin perfect use of your fabric. I love this fabric. Her quilt is so cute too. I'm off to take a better look. 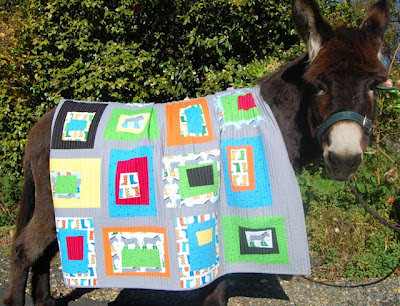 Sooo cute donkey, I lovethe line of fabric great looking quilt to its perfect! Those donkeys in boots are hilarious. I think a kid would love a quilt with these fabrics. Oh no, Sunday night??!! I just read this, I have been away all weekend and am just catching up on my blog reader! Hope I didn't miss my chance. For the record, I like the name Wonky Donkey 2... !!!! I love this fabric! I think Wonky Donkey 2 is a good name for the quilt.